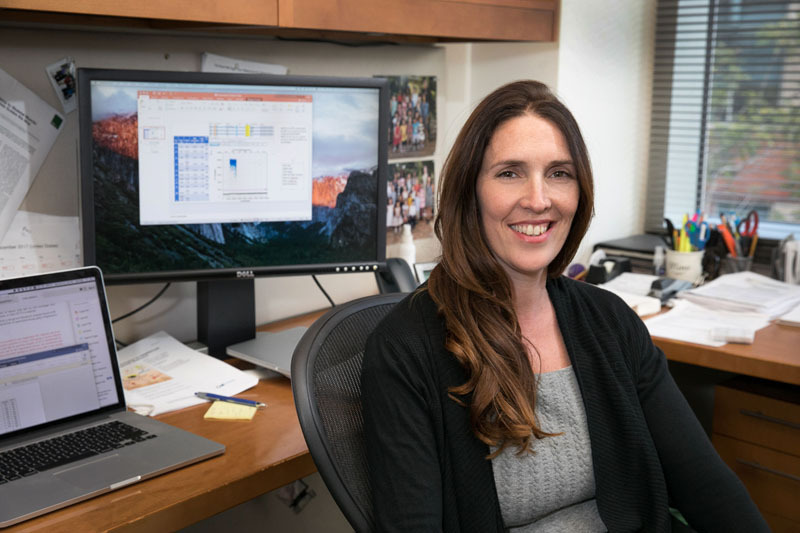 April Pyle, Ph.D., seeks to develop a better understanding of human pluripotent stem cells, which can self-renew as well as produce any cell type in the body through a process called differentiation. Through pursuing a better understanding of the biological processes that drive pluripotent stem cell self-renewal and differentiation, Pyle is gaining insights that could unlock the potential of stem cell-based treatments for a host of diseases. Pyle is particularly interested in how pluripotent stem cells differentiate into skeletal muscle cells, which are affected by many muscle-wasting disorders, including Duchenne Muscular Dystrophy, a lethal genetic disease that affects approximately 1 in 5,000 boys in the U.S. Pyle’s extensive study of the biological underpinnings of Duchenne muscular dystrophy has led to several significant breakthroughs. She and her colleagues have developed an approach to correct the genetic defect that causes Duchenne and recently, her lab devised strategies to generate somites, the cells that give rise to skeletal muscles, bones and cartilage during development, as well as create skeletal muscle cells from human pluripotent stem cells. Each of these discoveries represents a major step towards the development of a cell replacement therapy for Duchenne. Another aim of Pyle’s work is to identify the signals that balance survival and self-renewal in stem cells in order to prevent instability that can lead to tumor development. Cancer is caused by mutations to genes that lead to abnormal cell growth and, like other cells, stem cells are vulnerable to this cancer-causing mutation. By examining how stem cells survive, differentiate and self-renew in a dish, Pyle hopes to uncover how this process may go awry and lead to cancer. It is her hope that this understanding could help to improve clinicians’ ability to prevent, detect or treat cancer. Pyle received her doctorate degree from the University of Tennessee and completed a postdoctoral fellowship at Johns Hopkins University. Pyle’s work is funded by the National Institutes of Health, the California Institute for Regenerative Medicine and the UCLA Broad Stem Cell Research Center, including support from the Wendy Ablon Trust. April Pyle's lab studies the biology of human pluripotent stem cells (which have the ability to become any cell type in the body) and the differentiation of these cells into other cell types for use in regenerative medicine. In this video, she discusses her efforts to use human pluripotent stem cells to create repaired muscle cells that could potentially be used as a treatment for Duchenne Muscular Dystrophy and other forms of muscular dystrophy.